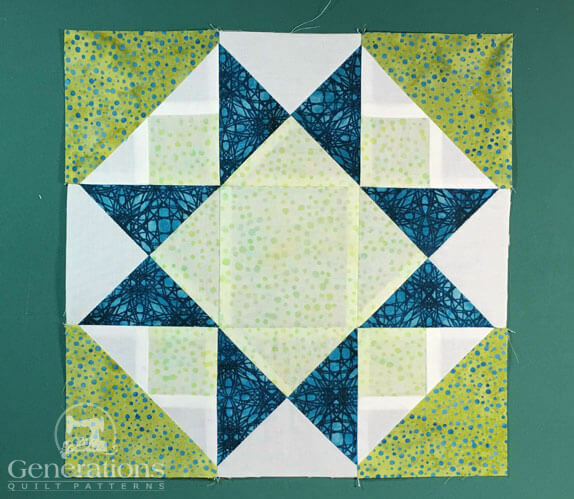 If paperpiecing isn't your thing, you can always use traditional techniques for your Morning Star quilt block. 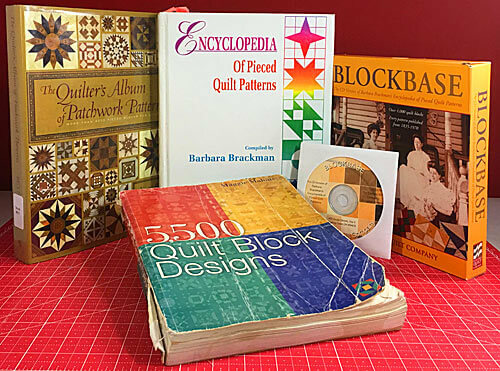 Both paper piecing and traditional piecing techniques are provided—choose whichever suits you better. 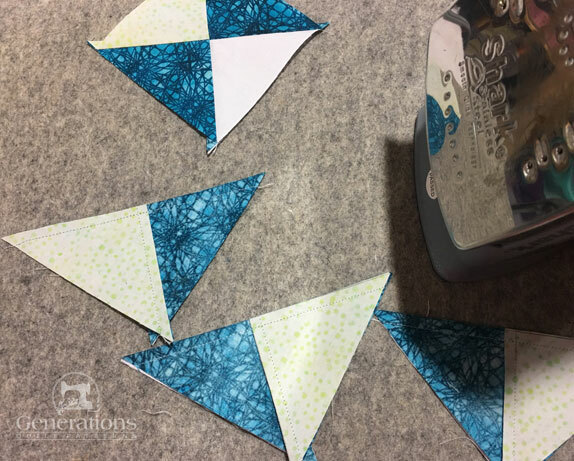 It's time to cut up and sew! 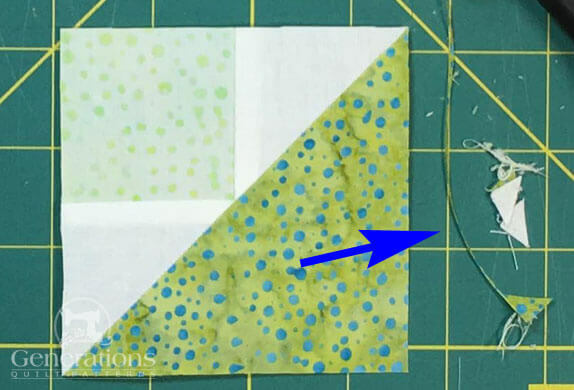 If you'd prefer to paperpiece part of this block, click here for those instructions and cutting chart. Click here to discover the secret! 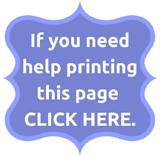 For instructions to print this whole tutorial page, click here. You'll need a light, a medium, a dark and a background. Our pale green dot batik is our light, with white as the background. 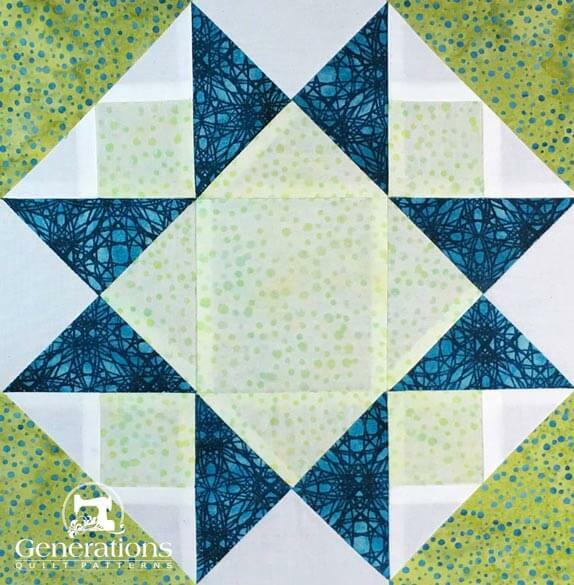 The green chart below is for a traditionally pieced Morning Star block. 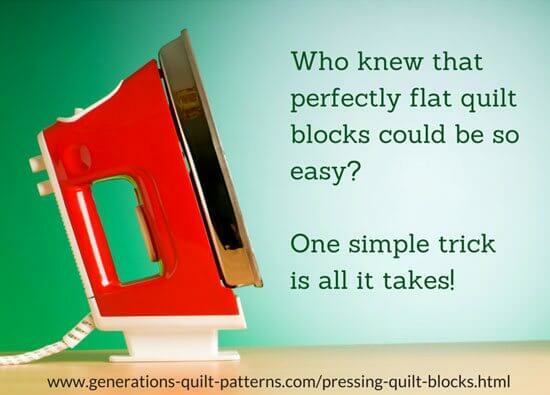 Click here to print a copy of it and the block design to use at your cutting table. Use the green printed chart. 2, 3	 Bac	 4	 1⅞"	x	1⅞"	 2⅜"	x	2⅜"	 2⅞"	x	2⅞"
4	 Med	 2	 2⅞"	x	2⅞"	 3⅞"	x	3⅞"	 4⅞"	x	4⅞"
**I prefer to cut my patches extra large for QST, stitch, and then trim them to size. 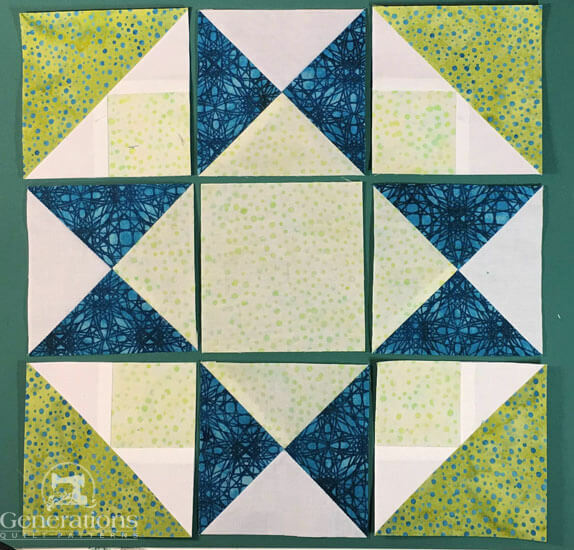 If you prefer to do the same, add a bit extra to the measurements for Patches #5, #6 and #7 above (I added 1/2" to each dimension for the sample block). 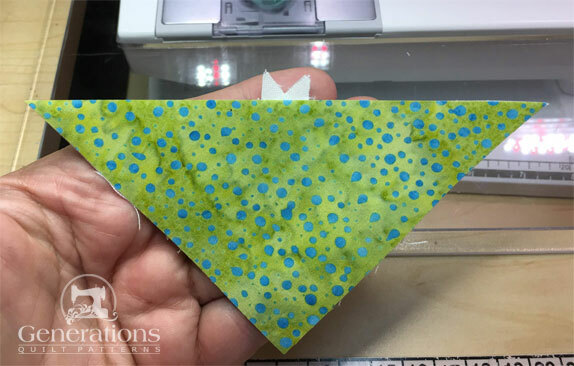 If you have a perfectly reliable 1/4" seam allowance use the dimensions in the cutting charts for this patches. 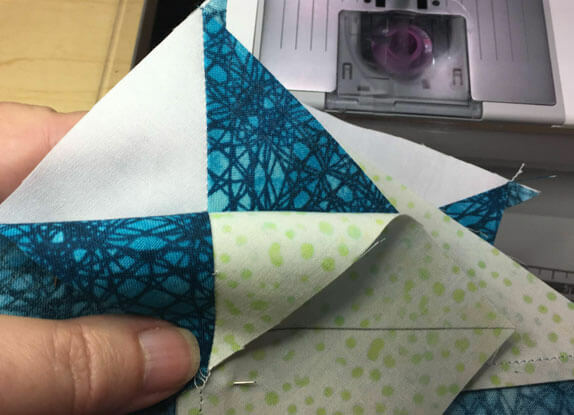 The same numbering system is used for both the paperpieced and this traditionally pieced unit. 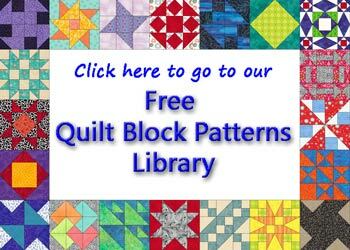 Starching your quilt fabric before cutting, in my humble opinion, making both the cutting and piecing more accurate. My preference is a 50/50 mix of StaFlo Liquid Starch concentrate and water. With RST, align the short side of a #2 with #1 and stitch with a 1/4" SA. Press with the SA toward #2. If your #2 triangle extends past the bottom of #1, you've done it right. This bit of excess disappears after adding #3. Align the short side of #3 with the adjacent side of #1. You might want to flip open the patches before stitching to check that the edges of #2 and #3 form a long straight edge. 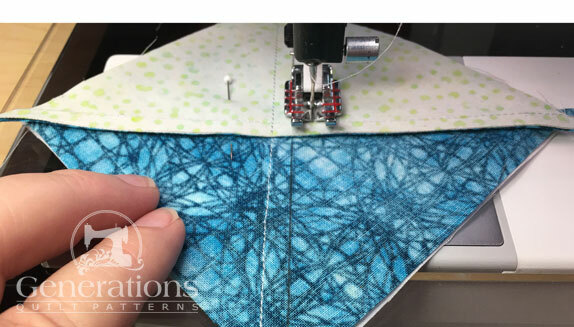 This seam will cut through the point on the V at the bottom of the stitching line. After pressing the SA towards away from #1, you can see that we, indeed have a nice long, non-jaggedy edge. Perfect! The blue arrow points to the dog ears. These are clipped away with scissors at some point. With RST match all the edges of #4 with #1/#2/#3. If your cutting and SA are accurate, they should match exactly. Here's the view from the #4 side. Those dog ears need a trim. They get in the way of my favorite 1/4" foot—the one with a guide on the right-hand side. And here's the view from the #1/#2/#3 perspective. A very good match! After this last seam, it's a good idea to check that the finished BW unit is the correct size. Use the table below to check for accuracy and find the center of the unit. 6"	 2-1/2" x 2-1/2"	 1-1/4"
9"	 3-1/2" x 3 1/2"	 1-3/4"
12"	 4-1/2" x 4-1/2"	 2-1/4"
For our 9" finished sample, our BW units should measure 3-1/2" x 3-1/2". The center is at 1-3/4". 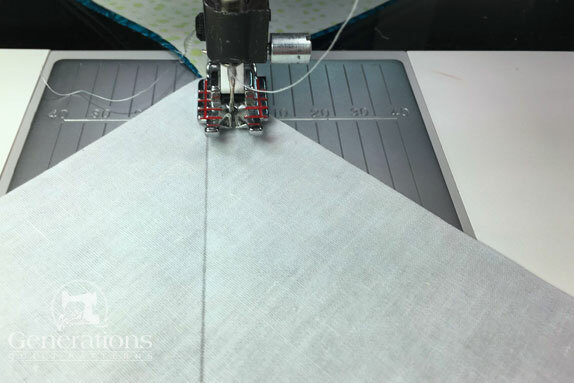 At your cutting mat, position the 1-3/4" line of your rule on the seam between #1 and #2, and then #1 and #3. 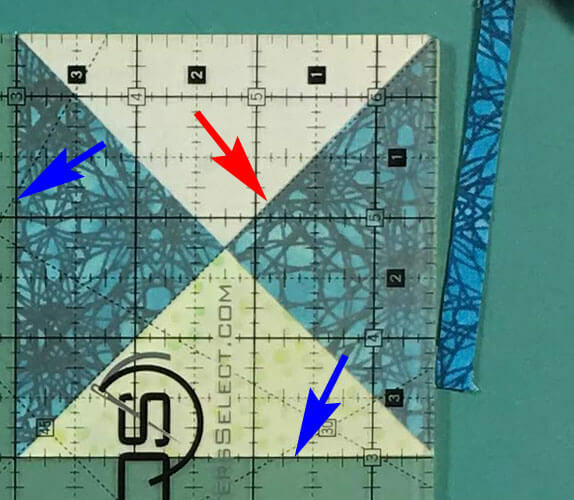 The diagonal line is directly on top of the diagonal seam (blue arrow). Trim the top and right sides and then flip the block, repeat the ruler positioning and trim the remaining two sides. Here is our finished unit after just a wee bit of a haircut. Just the tiniest bit of trimming needed(blue arrow). Repeat for a total of 4. On the back of the #6 and #7 draw a diagonal line from corner to corner. With RST, layer a marked #6 or #7 with a dark #5. 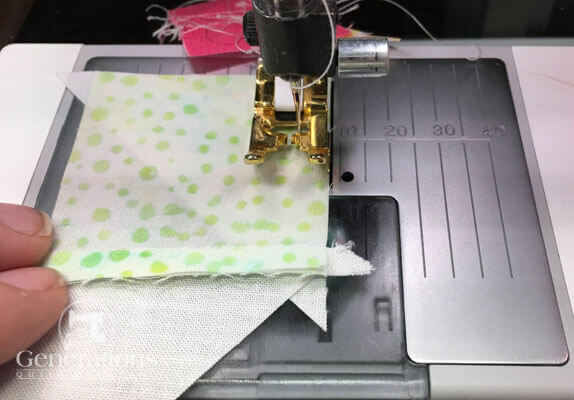 With your favorite quarter inch foot installed, stitch 1/4" away from both sides of each line. Repeat for each pair. 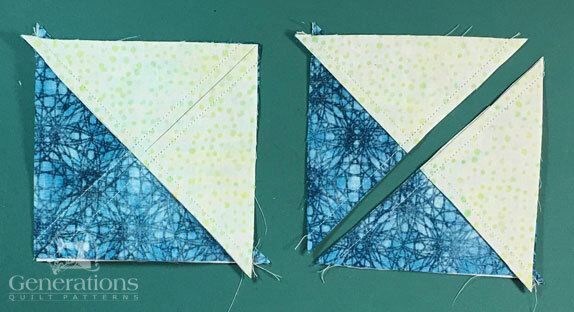 Cut the HSTs in half on the lines. Press the HSTs open with SA to the darker #5s. Though it's a bit hard to see the two on the left are my dark plus background fabric. The two on the right are my dark with the light fabric choice. If you started with over-sized patches like I do, you'll have a bit of wiggle room so don't worry is the ruler isn't exactly in the corners. Draw a diagonal line with your favorite marking tool. 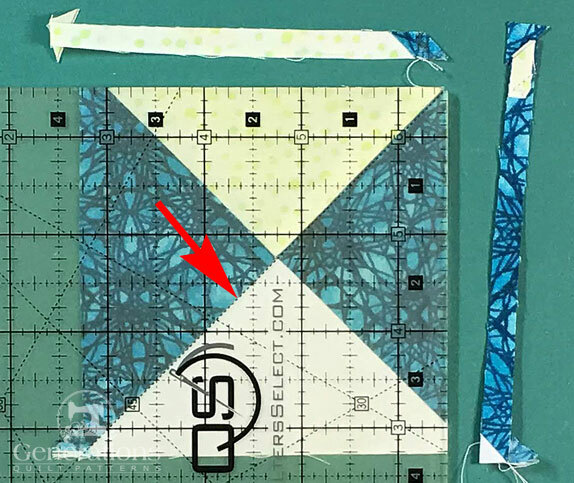 Here you can see just a bit better that the ruler is aligned with stitching (red arrow). My stitches are directly under this dashed marking on the ruler. 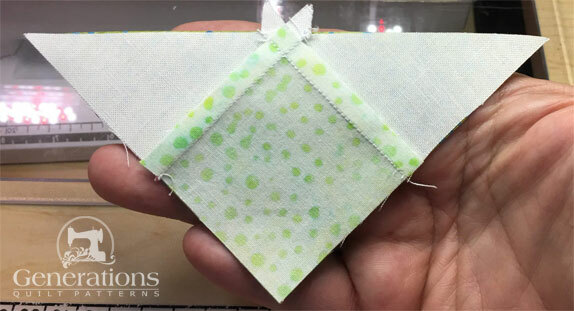 With RST, layer a #5/#6 and a #5/#7 HST, nudging the seams together with your fingers in the center. 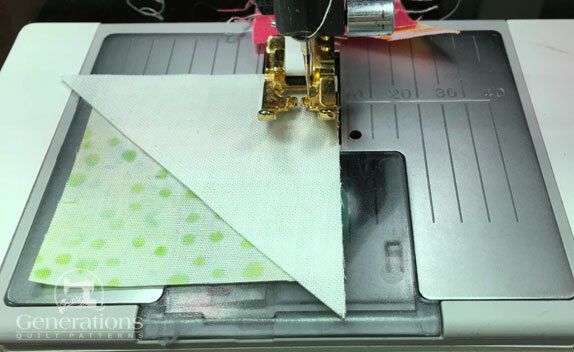 I pin to help hold these seams together during sewing. Here, before sewing, I've pulled back the top HST to check that the seams are matching up and that the dark fabrics alternate. Stitch 1/4" away from both sides of each marking. 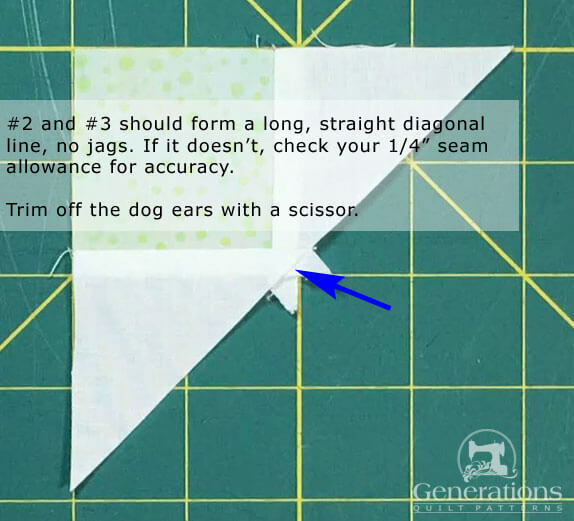 After sewing, check for a good match at the center of the QSTs. Yep. That's a good one. Cut in half along the markings. Press the QSTs open with the SA in either direction. I love my Magic Pressing Mat...everything presses so nice and flat. 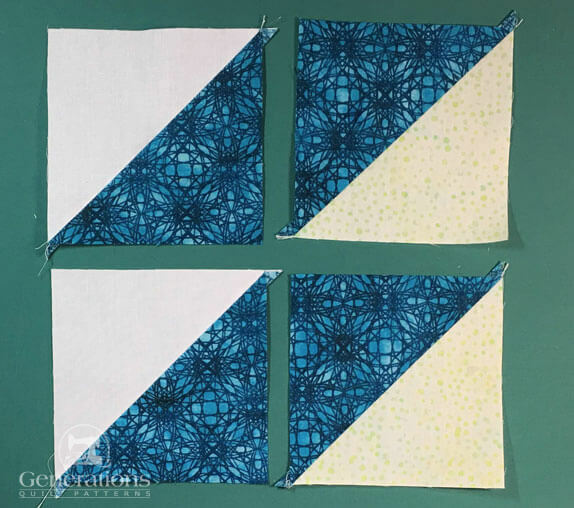 Refer to the table below and find the Center/Midpoint Measurement that corresponds to your chosen Finished Block Size. 6"	 1 1/4"	 2 1/2"
9"	 1 3/4"	 3 1/2"
12"	 2 1/4"	 4 1/2"
You need a square ruler with a 90° diagonal line that runs through the corners for trimming. My very favorite ruler for this job is the new one by Quilters Select. 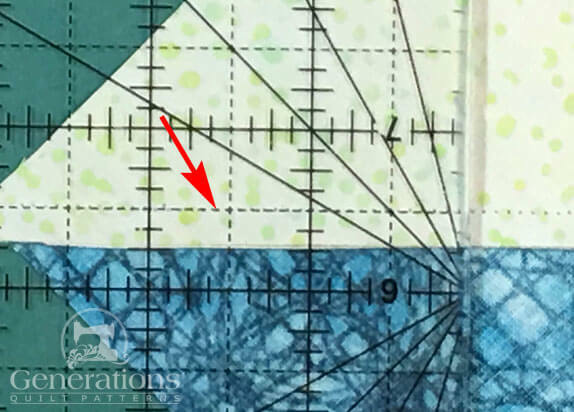 Position the diagonal line of the ruler right on top of the the diagonal seam line (red arrow) and the Center/Midpoint Measurement marks directly over the center of the QST where all the seams come together. For our 9" sample Morning Star that measurement is 1-3/4". 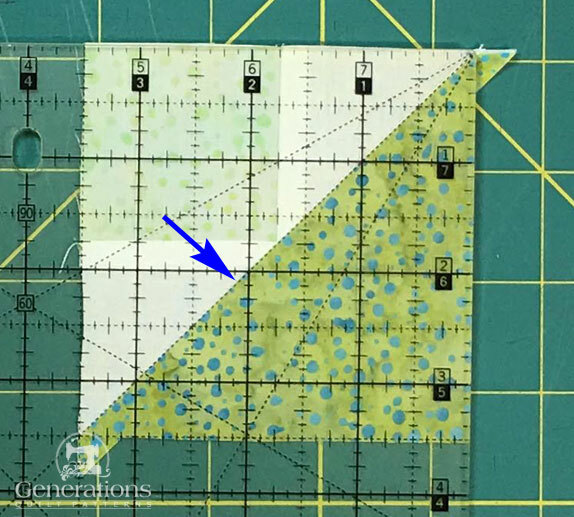 This is my new favorite ruler for trimming half and quarter square triangles—my Quilters Select in action. It just doesn't slip. Sweet! If you cut your patches exactly as in the chart, you'll be using this measurement to check that your patches are the correct size. Make adjustments as needed. 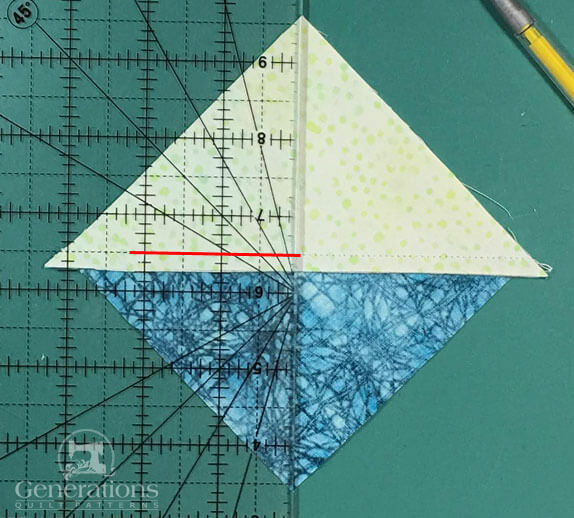 Rotate the QST so that the two cut edges are now under your ruler. Align the diagonal ruler line as before (red arrow). Find the Trim QSTs to... measurement in the chart above. These marks on your ruler should be directly over the two trimmed edges. For our 9" sample, that's 3-1/2", and it's right over those cut edges. Repeat these steps until you've completed four perfect QSTs. 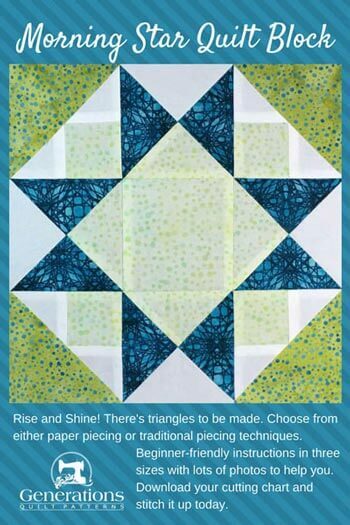 Lay out all your patches to create the Morning Star design. 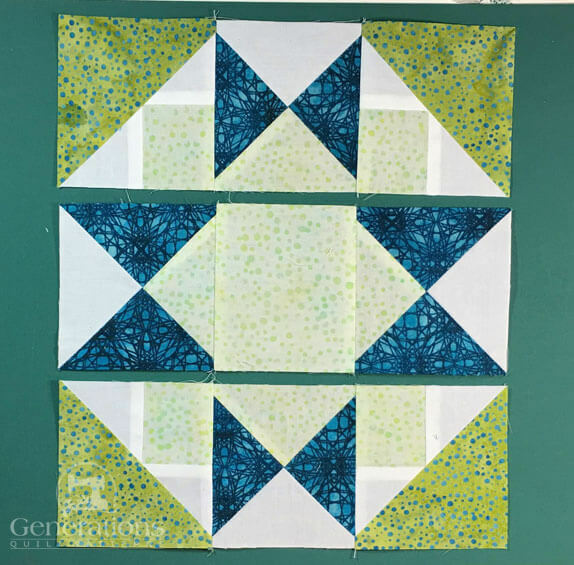 The light fabric patch in each unit is towards the center of the block. It forms a square behind the Ohio star design. With RST, stitch the units in each row together. 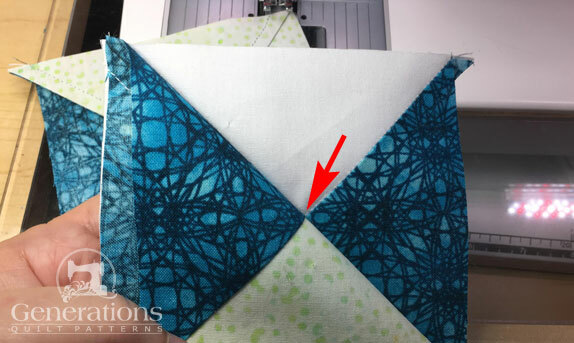 The seams of the large triangles in the BWs (green dot) and QSTs (dark blue) nest to make matching the points at the outside edge virtually foolproof. SA are pressed toward the BW units and the center square in the middle row. Sew the rows together, pinning when needed to help keep everything lined up and points matching. 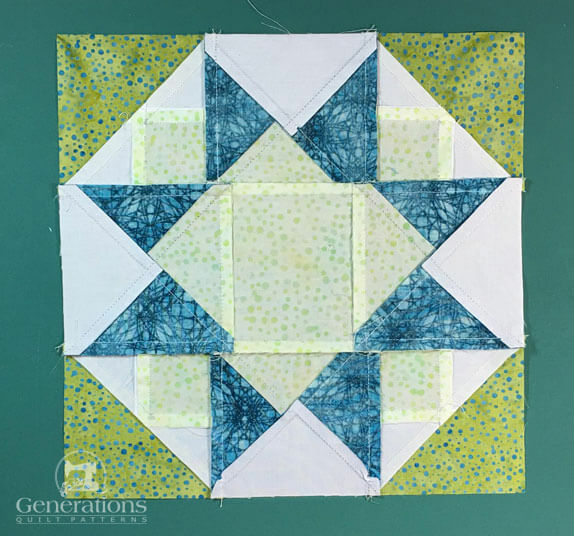 This is our finished Morning Star quilt block. To help you understand how all the SAs fit together, here is our Morning Star block from the backside.